Results: Sneaky, Sneaky: Show All Sneakers? Or Showcase Just One? The creative conversion agency, Conversion Rate Store, ran this sneaky sneaker study for their client, Le Boutique, a popular apparel shopping club, with over 4 million monthly visitors. Le Boutique is a Russian retailer requiring visitors to signup in order to shop and get special deals. The signup requirement is similar to the popular American shopping site, Wish. If you want access to a variety of great goods, you gotta give your email address first. The goal of this study — which ran as part of a series of tests — was to determine the best format for increasing email signups. To quantitatively crush this quest, the testing team starting by conducting an extensive data-drive analytics audit. Clickmapping data, session recordings, and online surveys were all put together to fully understand shopper behavior. Clickmapping data revealed 18.72% of users were clicking on product images — that were behind the email signup wall. This information indicated users wanted more information about products, without wanting to sign up. As well, online poll results clearly showed that users weren’t keen about immediately having to give away their email address to shop. Before divulging their details, users first wanted to see what products were available and on sale. Originally, the email signup format only showcased one product, with a signup box placed directly next to the product picture. Since customers clearly indicated their preference for seeing more products before signing up, the testing team suspected adding additional images of products would help users feel confident that there was, literally, more in store. And, as a result, more users would give their email address, and signup. However, the team didn’t know if the strategy of adding additional images would actually work. So, decided to put it to the test. To test the effect of showing more images, an A/B test was set-up and run on Google Optimize. The study ran for 14-days. During this time, over 113 thousand shoppers were directed to one of two email signup pages. Traffic was split 50/50. Email signup conversions were tracked across both versions. Showcasing several sneakers was a sneaky tactic that strongly succeeded! Tempting visitors with the promise of seeing all 231 sneakers skyrocketed signup subscriptions a solid 72.8%, compared to the single image version. Results achieved 99% confidence. To get you gotta give. For many of us, our email address is a prized possession. We don’t want to give it away easily. When immediately hit with a signup wall, it can be a huge turnoff — especially when its unclear what’s behind that wall. Nobody wants to signup for something, feel disappointed with what’s offered, and then get bombarded with irrelevant emails from there on in. Users need to feel confident that the transaction — their email address for the ability to access, or view, your products — is a worthwhile deal for them. Even if it’s free to signup. To allay consumer concerns, it’s helpful to explicitly state what’s given in return. Both compelling copy and enticing images can help achieve this objective. This study also show, it can also be valuable to quantitatively state as well as clearly show shoppers what they’ll get to see — if they sign-up. In this case, the sneak peak of sneakers was a sneaky technique to get shoe shoppers to show their wares and signup. 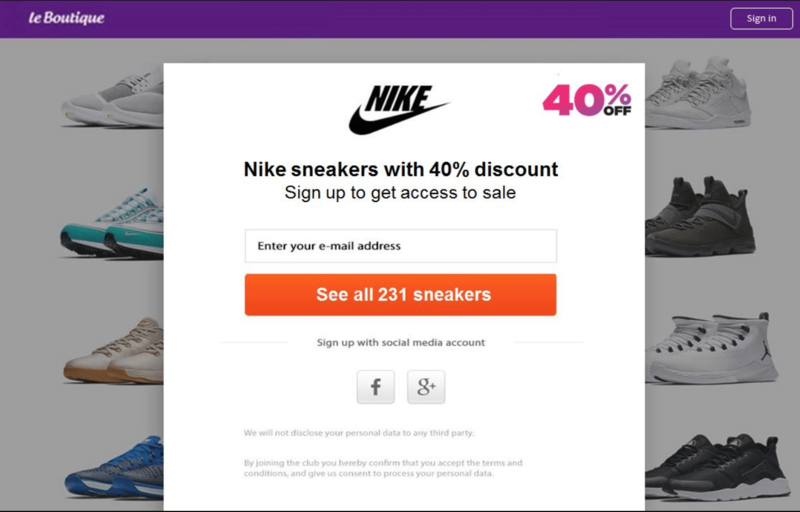 The fact shoppers could see 231 of the coolest kicks was a compelling enough give to create a double-digit signup conversion lift. In the view with just one pair of shoes, it was a gamble. Anyone who loved those particular pair of shoes might have been drawn enough to the image to signup. But, for everyone else, seeing multiple products was what created the draw. Show and tell. Create visual value. Use enticing images and compelling copy to explicitly state what visitors will get in return for signing up. Show them what’s in store. Literally. The more you give, the more you’ll get. Interested in seeing more inspiring studies like this? Become a Pro Member. What's involved?